G4E Lovers Day Escape 2019 is another point & click escape game developed by Games4Escape. 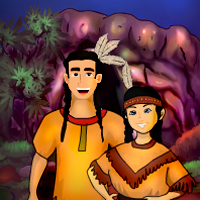 In this game you have to help Lovers to escape from this cave. Assume that someone locked the Lovers. They need to move out for Valentines Day Celebration. They need help now. Click on the objects to interact with them and solve simple puzzles. Good Luck and have fun! The music is terrible and a memory game where you lose the correct cards already uncovered is more than tedious.